The ability to transport mobile power plants via Energy Generating Vehicles to remote, even desolate locations is being made a reality by Sfinkx Corporation. In a press release on November 27, 2012, Sfinkx Corporation announced its intent to develop advanced Energy Generating Vehicles (EGV) that can contain a power storage capacity or be accompanied by a Battery Energy Storage System (BESS). Sfinkx development of photovoltaic (solar) Energy Generating Vehicles will fill needs of mobile power generation for smart tactical micro grids. The new energy generating vehicle (EGV) will solve electricity creation and storage problems for use on the battlefield and in emergency situations. The U.S. Department of Defense’s Operational Energy Strategy is to integrate energy efficiency and renewable energy, reducing demand for energy on the battlefield and bases. EGVs will greatly increase power provision efficiency in the field; limit the risk troops face as they use, transport and store energy; and minimize defense dollars spent on consuming energy. FEMA has also displayed great need for this solution at emergency sites where electricity has not yet been restored while they respond to, and help recover from disasters. EGV’s allow for mobile deployment of vehicles that produce energy at the source where it is consumed. 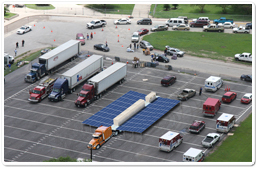 Equipped with photovoltaic energy generating systems, these vehicles can be used to power the on-board systems or to energize a Battery Energy Storage System (BESS). Used as a stand-alone energy source, a BESS provides remote locations with a dependable source of energy. These batteries never loose their charge while not in use, and can be deployed fully charged or in conjunction with energy generating vehicles, and can be recharged while deployed in order to provide a constant energy source for mobile command stations or emergency management scenarios. An armored container can house the BESS and form a power hub so that any military or emergency response vehicle can be directly connected to the power hub.